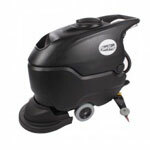 This package is designed to polish any type of hard flooring, from ceramic tile, to concrete floors. The 20 inch polishing path covers a large area, in a short amount of time. Each case of 20 inch green mint pads are soft, and will not harm any tiled surface with a proper finish. They will also provide a tremendous shine when used with our floor restoring solution, that can can be used as a spray buffing solution, or a mop-on solution. The burnisher comes with a fully adjustable handle to easily operate the machine, no matter the height of the operator. This feature allows you to either free float the handle or lock it into place. When you free float the head, it does not allow the pad to dig into your finish to take out those deeply embedded scuff marks. When this happens, the burnisher's motor comes under stress, and starts pulling more voltage through the circuit. This can end up in the tripping of breakers in your customer's facility, as well as lessening the life of the motor on the polisher. The head of the machine is designed to just free float over the floor, which in turn, provides the highest possible shine. If, you lock the handle into place, you can then use the burnisher to dig into the floor finish, and remove those deeply embedded scuff marks. Please feel free to take a look at our full line of floor buffer & burnisher packages that we have available, if this is not exactly what you're looking for.